The global travel and tourism industry made more than 7.17 trillion U.S. dollars in total contribution to GDP worldwide in 2015. The leading three travel and tourism markets, North America, the European Union and North East Asia, comprised nearly three quarters of this figure. Ranked fourth in this list, Latin America’s travel and tourism industry made a total contribution of more than 371.8 billion U.S. dollars to the region’s GDP – including 135.6 billion directly contributed by the industry. By 2026, the total GDP contributed by the Latin American travel and tourism industry was expected to rise to around 600 billion U.S. dollars. In 2015, Latin America welcomed approximately 97 million international tourist arrivals, with Mexico receiving the most. That year, those visitors spent almost 17.73 billion U.S. dollars in the country. 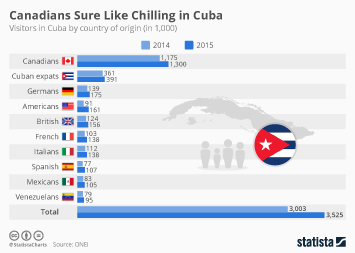 With over a third of international visitor spending being accumulated in the Caribbean, it is unsurprising that the city in which tourists spent the most was Punta Cana in the Dominican Republic. In December 2015, the Caribbean also saw the highest average daily hotel rate in Latin America at 306.2 U.S. dollars. Known for its luxury resorts, the Caribbean boasted an average hotel room price 170 dollars higher than the next most expensive region, South America. Like many other regions worldwide, Latin American tourists will be traveling more in the near future. Around two thirds of Brazilians expected to do more traveling in 2015, along with around 61 percent of Mexicans. More than 40 percent of travelers from Brazil and Mexico said they travel to experience culture, making them the most cultural travelers in the world after those from Russia. In terms of those traveling to Latin America, travel company Travel Leaders Group named Costa Rica as the most up-and-coming destination for 2015.